Christmas Eve 2014 we were at my in-laws’ celebrating the holiday and everybody was sitting around the tree opening presents from the mother and father-in-law. My gift from them got passed over and it was heavy. I opened it in utter shock and disbelief. A sewing machine????? Shock again. A sewing machine???? Why in the h*ll would they get ME a sewing machine??? I’ve never expressed any interest in sewing. I’ve never used a sewing machine except for 1 week during home ec in high school and that was not one of my finer home ec assignments to say the least. They could have given me $50 that would have ultimately gone to pay the power bill and I would have been just fine but no, they got me a sewing machine. I thought “they don’t know me at all if they actually thought I needed a sewing machine.” I was very disappointed. Remember when Ralphie got the pink bunny suit on A Christmas Story?? Yeah that was me… So when we got home and was unloading the truck I told my husband I guessed I’d have to make something with the sewing machine since they got it for me and I couldn’t imagine why in the world they got me a sewing machine. I racked my brain trying to figure out what I would make with this sewing machine. I searched sewing projects online but I had no interest in making napkins or table cloths. I’ve always loved quilts and I did my research on how to quilt. After about 2 weeks of searching and researching quilts, I had an idea of the other materials I would have to get in order to be able to make a quilt. I learned my machine would not support a walking foot so I had to order me one that would and I took the original back (after I pieced my quilt top together while I waited on the arrival of my new machine). Long story short my very first project was a quilt. A pretty big quilt: 88 x 70. It was a lot of work and I had been unprepared for the extensive work it was. It’s not show-perfect: it has puckers and tucks but it’s usable and pretty and my family loves to use it so it’s family-perfect. I would never part with it. It’s special to me. As for my sewing machine? Well I’d never part with it either! I love to sew and create and quilt and I’m very happy my mother-in-law decided to get me a sewing machine. 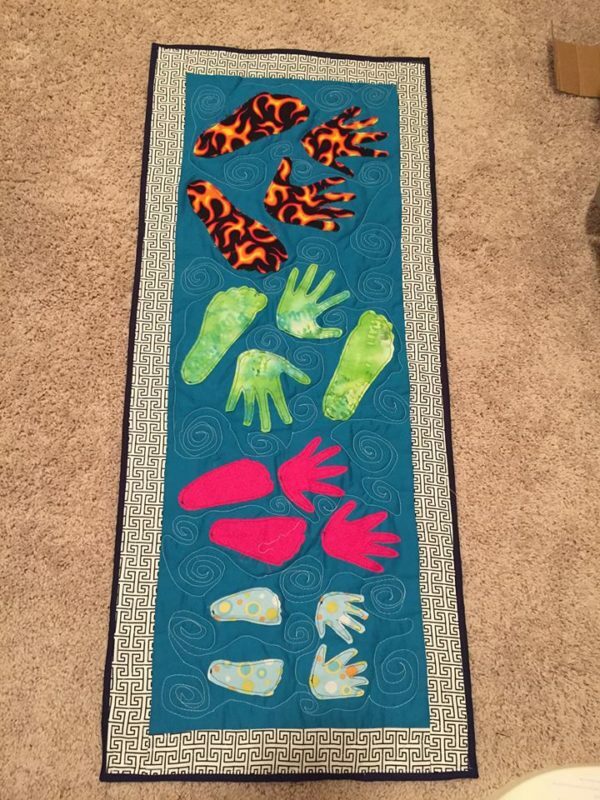 To date I’ve created 4 large quilts, 3 baby quilts, 1 baby quilt blanket, 6 outfits for my children, 2 mini quilts, 1 quilted bag, some appliqué pieces, done some alterations to some of our clothes. In other words I’ve USED my machine. One of the best gifts ever! A little bit about April- I’m a mother of 4: ages 6,5,2, and 5 months with a full-time job and I love to create. My husband is glad I’ve found me a hobby.